BMW station wagons ride under the radar. 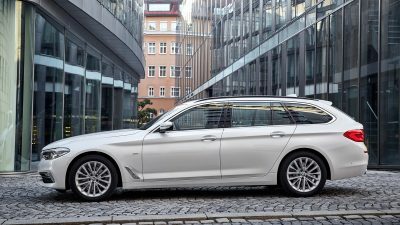 Riding with as much performance and prestige as their sedan siblings, the BMW Touring models offer greater practicality and, to some, even better looks. 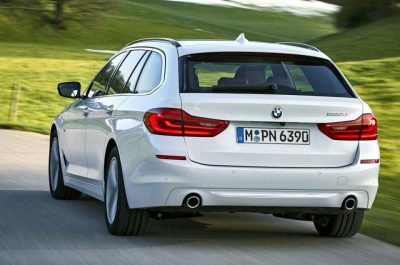 2017 BMW 5 Series Touring models have low and long rooflines that drop smoothly over the tailgate. A breath-taking impression of low slung performance looks striking in the new 5 Series Touring silhouette. Low and wide, in BMW guise, equates to a driving experience that provides an amazing ride and awesome handling. Slip inside the interior of a 2017 5 Series Touring wagon, and the seating is extremely comfortable with premium leather and loads of space. Fully electronic adjustment with memory and heating/cooling is standard for those riding in the front seats. A sense of solidarity in interior workmanship, elegance, and pride are what drives the satisfying look and tactility of the new 5 Series Touring cabin experience. The sense of quality you’ll find in the 5 Series interior is hard to better even in a bigger flagship 7 Series. Familiar blues, blacks, whites and greys tone the interior colouring, keeping things elegant and tasteful. 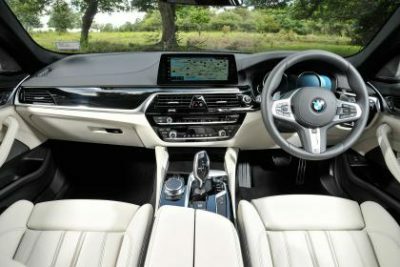 Owners can choose various interior trim inserts that include Ivory, Mocha or even Cognac-coloured leather to define their own new 5 Series Touring wagon. Fine woods and brushed aluminium are some other alternatives. Any of the Touring models come with the latest Professional Navigation package that boasts a crisp 10.25-inch screen in the centre of the dash. This touchscreen can even be controlled with voice control, from the centre console dial, touch or even gesturing functions. We are all likely guilty of owning a modern smartphone, and BMW recognise this. BMW has moved to make each new 5 Series Touring capable of instant connection to your smartphone on entry, while the phone will top up with the car’s wireless charging capability. AppleCarPlay is standard, and there is a host of connection services that allow drivers and passengers access to online apps and real-time data. As you ease yourself back into the hugely relaxing interior, you’ll see plenty of storage compartments are available, a sizeable glovebox, big door bins, and a central armrest that doubles as storage. Head around to the back of the 5 Series Touring wagon, and the tailgate boasts gesture opening. 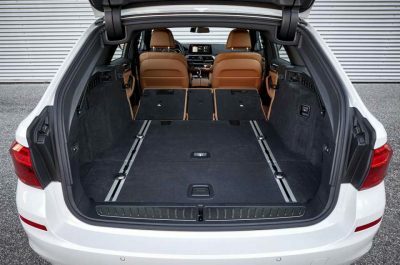 Being one of the longest wagons in its class, the 5 Series Touring has a handy boot space that is capable of swallowing loads of luggage (570 litres with the rear seats in place). The rear seats are split folding and can be folded flat. A range of four and six cylinder engines are available. Diesel and petrol engines are available, and all the engines feature somewhere else in the BMW range of cars. We will have to wait a bit before the new hybrid and electric motors become available. For me the 520d motor is a gem, providing low fuel consumption and decent performance. It’s not often you’ll get a car with such luxury, space and refinement boasting a 0-100 km/h sprint time of less than eight seconds along with fuel consumption that can be better than 5 litres/100 km. There is also the quick 530d with exceptional acceleration and high sped cruising ability, as well as the mid-range 525d Touring. BMW 520d and 530d models are also available with xDrive all-wheel drive systems. Petrol BMW 5 Series Touring models come with a choice of four-cylinder 520i and 530i models, and a range-topping six-cylinder 540i xDrive motor. One of the other comforting aspects of owning a BMW is that you know you are getting yourself into a car with solid engineering and design, and the engines and drivelines should prove dependable and economical to live with. The BMW 5 Series Touring competes directly against the latest and best Mercedes Benz E-Class Estate, Audi A6 Avant and Volvo V90; and it all comes down to taste and preference of what ticks the most boxes for you. All of these Euro wagons are superb, and for the Beemer, the station-wagon driving experience is very satisfying. BMW has a good reputation for quality, and safety is top notch – with a five-star crash test rating. For any more information on the latest BMW 5 Series Touring models or, for that matter, any other new car, contact one of our friendly consultants on 1300 303 181. If you’d like some fleet discount pricing (yes even for private buyers! ), we can submit vehicle quote requests out to our national network of BMW dealers and come back with pricing within 24 hours. Private Fleet – car buying made easy!